Captain Temporium is a classic fast paced shoot 'em all up style arcade game. An evil time traveling empire has altered the fabric of time by invading contemporary history. They've taken over our technological achievements, starting with the dawn of flight. Captain Temporium is the last remaining pilot of the temporal air force. She desperately fights the enemy wherever she finds them – in the skies from the early 20th century and on into the future. Now only you can save our history and future. Take control of her time machine and fight the endless onslaught! Gameplay hints: • Fire your weapon wisely – it may overheat and needs cooling then. • Defend yourself with the shields but always watch out that you don’t run out of shield energy! 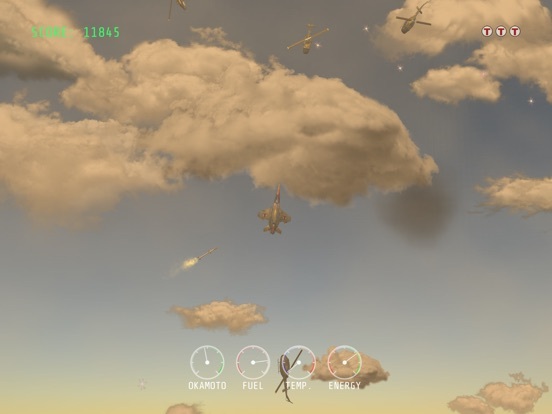 • Collect parachutes to get new shield energy, weapon improvements, cooling improvements, fuel for the afterburner, bonus lives or bonus score. 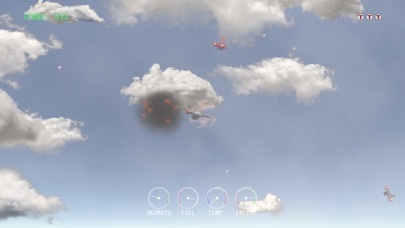 • Afterburner might help to escape enemy bullets or to get a parachute before it disappears. • Don’t fire at the parachutes! • Watch out! The enemy could be hidden by the clouds, don’t run into it! • Cloud cover will increase at higher levels and overall visibility will get worse. • Some enemies need more hits than others. Some will fire missiles at you. • The boss at the end of each level can be huge, really huge! It takes many hits to kill each boss. • Try to ram the with your shields if you still have plenty of shield energy left. • Overall speed and number of enemies increases with each new level. • Use the few slower levels at the beginning to collect as many parachutes as possible. 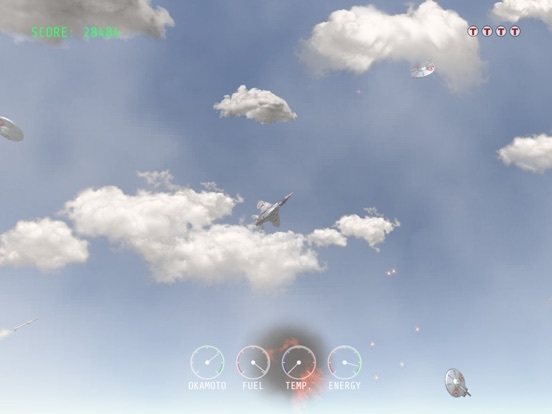 • Keep the main menu open and watch the AI vs AI battles to learn how the AI plays the game. Super infuriating controls and unforgiving gameplay. 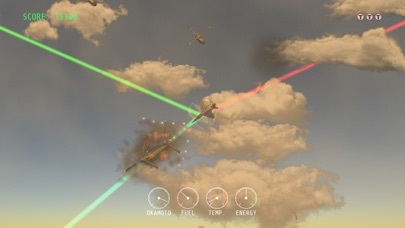 You shoot your little pewpew at the other planes and then crash into them and die. Not really finding any real sense of progression so far, I'll keep playing for a bit and see what happens. I'm finding this fun. You have to survive for a little bit and balloons appear providing powerups (so far a triple spread gun). 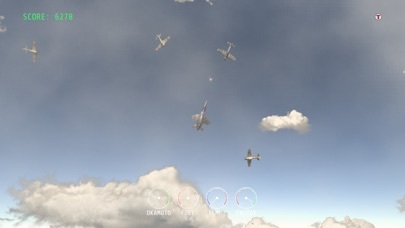 Powerups stay with the plane until you die. You get 5 lives and then the game is over. I made it to the 2nd mission which was 1940s, so I can see that this will get cooler as I play. So far, it's a fun little fly n shoot (not really a schmup in the defined sense). I'd recommend it for $2. 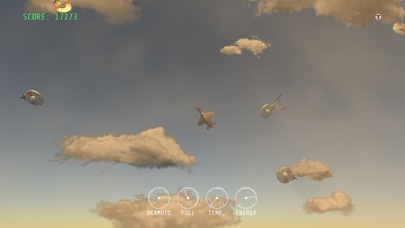 Nice, it looks like the old Time Pilot arcade game but in steroids! I used to love that game. Hello, Im the developer of it. It looks like I have to add hints to the game  sorry my fault.  Fire your weapon wisely  it may overheat and needs cooling then.  Defend yourself with the shields but always watch out that you dont run out of shield energy! 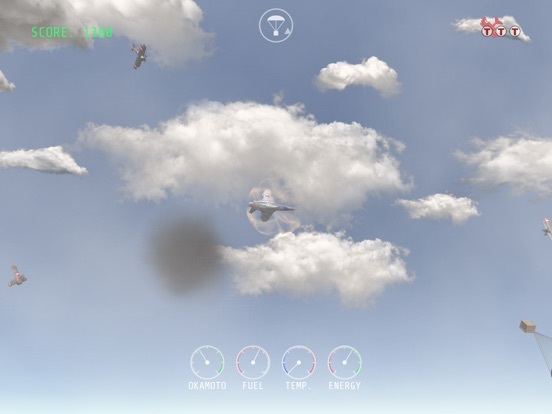  Collect parachutes to get new shield energy, weapon improvements, cooling improvements, fuel for the afterburner, bonus lives or bonus score. 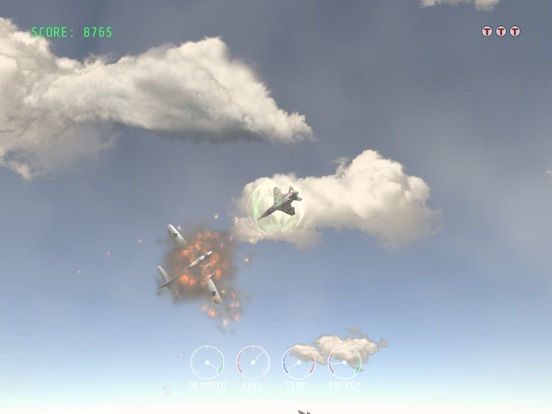  Afterburner might help to escape enemy bullets or to get a parachute before it disappears.  Dont fire at the parachutes!  Watch out! The enemy could be hidden by the clouds, dont run into it!  Cloud cover will increase at higher levels and overall visibility will get worse.  Some enemies need more hits than others. Some will fire missiles at you.  The boss at the end of each level can be huge, really huge! It takes many hits to kill each boss.  Try to ram the with your shields if you still have plenty of shield energy left.  Overall speed and number of enemies increases with each new level. Keep the main menu open for a few seconds and watch the AI vs AI battle to learn how the AI plays the game. How are the on screen controls done? I absolutely loved time pilot so this game is right up my alley. The screen is split in two halves: one touch zone to steer the jet and the other one to trigger fire and shields.  just drop your finger anywhere on the control touch zone and drag it left/right to rotate the jet.  In the settings menu you can flip touch zones between left handed and right handed and adjust the sensitivity. I went and bought it last night. I spent the last hour playing the game. Adjusting the sensitivity. Messing with it. Playing and playing. I simply cannot play well with the controls. I can't. It's more frustrating than fun the way it's set up. The best way for me that lets me last more than 15 seconds is having the sensitivity up all the way. No matter what I still end up having to slide my finger out of position. Why can't we have a analog joystick that we can make static? I want to like this game as I love the concept I'm just really really really having a hard time with it. Thank you, this is helpful to hear. And when I look at the scores it is obvious that people struggle with the controls. I will change controls on iOS with the next update. Guess I should know it What exactly do you want to know? 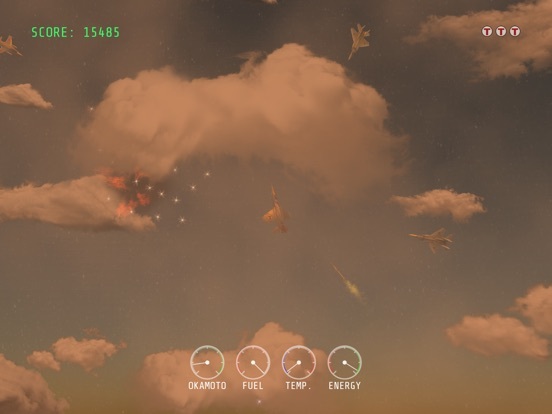 Basically it is getting harder which each level and your goal is to get the best weapon to clean up the sky. Yes. That's exactly how I want it. That's exactly it. This way my finger doesn't constantly move out of position. Great, then Ill add it this way. 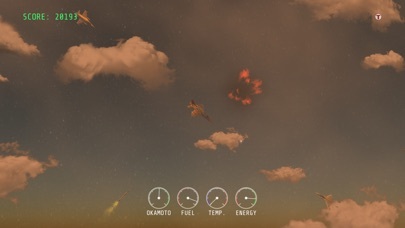 But I have to add a button for afterburner then. This means Ill switch from touch-zones to visible buttons. That's fine. It should be just fine. Since you don't have to really hammer the fire button constantly it's ok.
Time pilot really was one of my all time favorites so I really have a sweet spot for this game!! I'm really happy someone has finally made something like this. The thing to learn (beside of getting used to the controls) is the right mix of keeping weapons cool and a smart usage of the shields to save as much shield energy as possible while trying to get the best weapon by collecting parachutes. But overall the most important skill you need for this game is reaction. The game becomes incredible difficult at really high levels. At some point the enemy presence is so massive and the game so fast that if you dont have the best weapon and you dont have really good reactions your chances to survive the level will become low. I doubt any human will ever see level 50 (Although my demo AI reaches such high levels frequently). Highest level I have reached on Game Center is currently Level 17. So is it like later in the game you have to get "lucky" and have a good weapon or you don't have a chance or ? No, its almost not about luck at all. You must be good to get a good score. And to get the best weapon you have to collect many parachutes. The randomness of the (hidden content of a) parachutes is limited  when you still have full shield energy and all fuel for the afterburner you wont get fuel or energy when collecting a parachute. And you wont get a laser when you dont have a tripple gun first. So it is smart to try to collect as much as possible in the first levels.